Lake Forest, Ill. - The Forester women’s hockey team swept the University of St. Thomas, the nation’s 10th-ranked team, over the weekend (November 10-11). Lake Forest prevailed 4-2 Friday night and 5-3 the following afternoon to raise its record on the year to 3-0-1. The Tommies fell to 1-3-0. The visitors score Friday’s first goal at the 11:14 mark of the opening period. 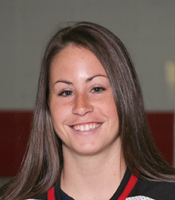 Senior Katie Snowden’s (Toronto, Ont./Willowdale Redwings) first goal of the season tied the score at 14:27. Her power play goal was assisted by juniors Allison Rushing (Seattle, Wash./Seattle Admirals) and Courtney DeHoey (Chatham, Ont./Bluewater Jr. Hawks). DeHoey scored the only goal of the second period with just 68 seconds left on the clock. Rushing and junior Laura Wilson (Corunna, Ont./Sarnia Sting) assisted on the power play score. St. Thomas tied the game on a penalty shot a minute-and-a-half into the third period. DeHoey then netted what turned out to be the game winner just 61 seconds later. Wilson assisted on the team’s third power play goal of the game. Finally, DeHoey assisted on Wilson’s team-high sixth goal of the year at 7:37. Senior goaltender Sally Bevis (Huntington, N.Y./North American Hockey Academy) stopped 25 of 27 shots on goal to earn the victory on Friday. Freshman Ryann McCarthy (Lombard, Ill./Team Illinois) was in goal on Saturday and recorded 21 saves in the contest, raising her record on the year to 2-0-0. DeHoey started the scoring on Saturday at the 5:59 mark of the first period. Her third goal of the weekend and season was assisted by Wilson and junior Jen Clouthier (Aurora, Ill./Chicago Mission). The Tommies tied the score on a power play goal at 12:12 but senior Michelle Ricketts (Rochester, Mich./Honeybaked) regained the lead for the home team just 34 seconds later. Freshman Maggie Bresser (Fond du Lac, Wis./Waupun H.S.) assisted on Ricketts’ first goal of the season. Freshman Sam Pinnsonneault (Manchester, N.H./New Hampton School) scored for the second time this year at 10:43 in the second period. DeHoey freshman Carolyn Thiess (Naperville, Ill./Canterbury School) assisted on the goal. The Tommies, however, converted another power play opportunity at 13:06 and tied the game again just 33 seconds later. Rushing’ power play goal with 25 seconds remaining in the period turned out to be the game winner. Clouthier assisted on Rushing’s first goal of the season. The home team added an insurance goal at 6:01 in the third. Junior Kerry Gotowka (West Simsbury, Conn./Westminster School) scored for the first time this year with another assist credited to Bresser. Lake Forest will begin Northern Collegiate Hockey Association play next weekend (November 17-18) at Finlandia University. The teams will face off at 7:15 Friday night and 2:00 the following afternoon.